I don’t eat meat. I think it’s gross. And I think there’s about a bajillion things in the world that can be made without meat that are full of delicious tasting goodness. In addition, I have (as clearly this article is all about me) recently been converted into one of those people that will fully cuss you out for eating…well…whatever it is I think shouldn’t be eaten. You know my type: you’re with a group of friends and you suggest a fabulous new charcuterie or steakhouse to go to for dinner, and your buddy’s girlfriend looks at you like you just murdered a dozen innocent lambs in front of her. Well ok, so that’s exaggerating, I’m not quite that bad. However, I will certainly sneer at the dude down the bar with a chicken wing hanging out of his yapper. Now I know there’s lots of serious omnivores here, like the wannabe sausage thief for starters (and yes! To answer your question Mr. Wannabe, it is wrong!) so I hope I don’t offend anyone. Oh, hang on just a jiffy – you offend me every time you rabidly chow down on the aforementioned chicken wing, so who am I kidding. But for all you Foodists folk who enjoy avoiding meat, and love new vegetarian/vegan recipes, that’s what I’ll be bringing you twice a month. To start off on our vegan goodness voyage of discovery, I introduce our guide: Veganomicon. Written by Isa Chandra Moskowitz and Terry Hope Romero this cookbook is just shy of 300 vegan recipe-filled pages, and I have yet to be disappointed by anything that I’ve made from it. If I could marry it I would, it’s that good to me. I eat the Chickpea Quinoa Pilaf on a weekly basis, can’t wait to have a go at the Mac Daddy (I’ll leave that one up to your imagination) and their Asparagus-Spinach Dip (remember this is vegan! so it’s dairy-free) has been added to my arsenal of dips & spreads. 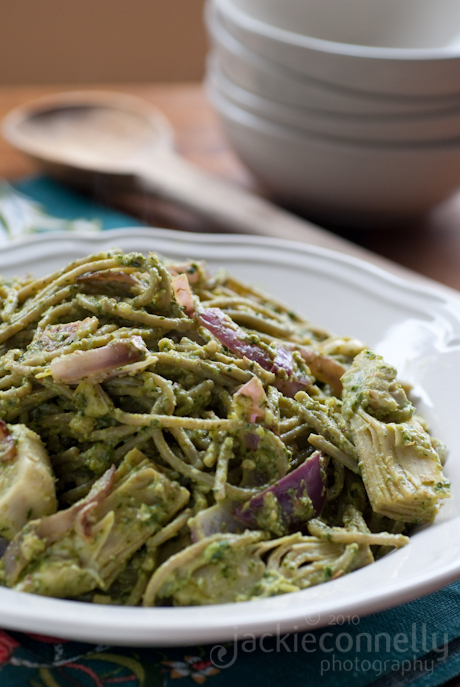 The one I want to share with you here is Spinach Linguine with Basil-Cilantro Pesto and Artichokes. My sister and I made it one night while watching Canada win a Gold in men’s snowboarding and we nearly burnt the s**t out of it we were screaming in celebration at the TV so loud. But I digress. *Tip: Make your pesto while the water for the linguine is boiling, so that you can time this right. Place the basil, cilantro, almonds, garlic, lemon juice and salt in a food processor and blend until pasty. With the food processor on, slowly drizzle in the olive oil. Blend until relatively smooth and no large chunks or almonds are left (*Jackie’s note: I don’t blend as much – I like chunks of almonds). If you don’t have a food processor use a blender and then just add the olive oil at the end. Bring a large pot of salted water to a boil and cook the linguine according to the package directions. Once you’ve added the pasta to the water, proceed with the recipe. 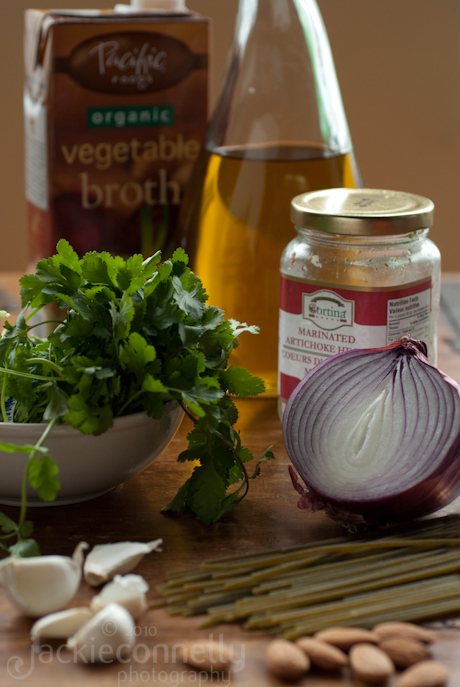 Preheat a large skillet over med-high heat and saute the onion in the olive oil until softened, 5-7 mins. Add the garlic and saute for a minute more. Add the white wine, salt & pepper and cook for another 1-2 mins. At this point the linguine should be done. When the linguine is ready, don’t drain it. Use a pasta spoon to transfer it to the pan in batches. This is a good method because you can use the pasta water to thin out the pesto and make sure that everything gets evenly coated. When you add one batch, add a bit of the pesto too and using the pasta spoon, saute to coat. Proceed with the rest of the pasta and pesto until you’ve added all of it. If it seems dry, add extra splashes of pasta water. Add the artichoke hearts and toss to coat. Cook gently over low heat just unit the artichokes are heated thought, about 3 mins. Go cook it now. Do it! Then thank Isa and Terry. And then invite me over for dinner. p.s. Maybe the authors will read this and send me a free cookbook that one of you lucky Foodists readers could win (hint hint). Vegan Brunch is a great book. I have not looked at Veganomicon. Bittman’s ‘How To Cook Everything Vegetarian’ is indispensable. I usually keep my mouth shut about being veg, unless someone asks. What I hate is the “Oh, I love meat, I could never give up meat” types. Yes, you could. Easily. Also, yes, I’m getting enough protein. Thanks, though. Yes, I’m getting enough iron too. Let’s go run a marathon and we’ll see who finishes first. I’m sick of listening to people talk about vegetarianism. It’s not novel. It’s not hard. And the food I eat is likely more interesting than the food these meat-eaters are getting. Looking forward to these articles. Thanks for those thoughts Jamie…and for those book suggestions, I’ll definitely check them out! I totally get the ‘oh maybe your iron/protein/etc is low’ too…usually from people who can’t imagine their own life without meat, and they really don’t know anything about not eating meat and all the iron/protein/etc replacements there are out there. Too bad! Anyways, let them chow down on their chicken wings and sides of beef ’till their cholesterol is through the roof, and we’ll enjoy our veggies. I hope I bring you more vegetarian goodness with my recipes! You know, I love vegetables. I also love meat. Basically, I love food. And I have friends who are vegetarian of various persuasions, including a number of vegans. I also have friends who have a number of dietary restrictions. We all get along. We eat what we like to eat, we share what we can share, and don’t share what we can’t. It’s not a contest, and it’s not about who is getting what nutrients or who has the more interesting food. It’s about enjoying food and enjoying each others’ company. I can understand why some vegetarians get worked up over some of the comments they receive, but most of it is just ignorance. Guess what? Ignorance can be cured. All it takes a little patience. On the other hand, when you get so worked up that you have a permanent chip on your shoulder, you’re only setting yourself up for more confrontations because of your own belligerence. So, thanks, Jackie, for the recipes. The attitude, not so much. Sometimes I wonder if the vegetarian diet isn’t just a bit too bitter. All in good humour Joseph, all in good humour. Ah. Sorry I missed that. I am a lover of food, plain and simple. Whereas I have no intention of giving up meat, and god forbid vegan (I am not programmed to survive without cheese) I do tend to eat vegetarian most days for a variety of reasons. It’s great to have a balance, so thanks Jackie for sharing. One of my favourite cookbooks, Greens, is vegetarian and are you familiar with the site 101 Cookbooks? You will find fabulous recipes in Tess Challis’ _Radiant Health, Inner Wealth_. I have thoroughly enjoyed everything I’ve tried (maybe 1/3 of the recipes? )…even my meat & potatoes beau agrees. What incredible photos of the recipes. And I like your tip about which artichokes to use. A quick plug: Earthsave Canada is a Vancouver based veg group that does a bunch of stuff – one is publish a guide on restaurants that is free. Thanks for your engaging post. Rebecca – always on the lookout for new delicious veggie recipes, this is much appreciated. Chris – thank you for the note on the photos, and for that link to Earthsave Canada, I will definitely check that out!